Vanguard Landing would like to send out a special congratulations to one of our future participants, Hannah Blum. 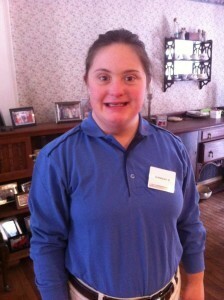 Hannah had her first shift at Harris Teeter (grocery store) in Northern Virginia on Monday, February 16th!! Hannah is excited to be working at Harris Teeter because she loves to talk to people, help others, and learn new things. Her main responsibilities are bagging right now, but Hannah is excited to gain a variety of skills that will help her succeed in other areas in the store. Hannah’s job at Harris Teeter will allow her to earn a paycheck, learn new job skills, and will help with becoming more independent! Hannah returned her Letter of Intent in January and is excited to be a part of Vanguard Landing. Hannah is excited to make new friends and will love helping out at the doggy day care at Vanguard Landing. Hannah is also looking forward to being closer to the beach!